Imagine walking through a field, metal detector in hand, scanning the ground for buried treasures. Your detector begins to beep, and as happens more often than not, you check to see what metal junk you’ve come across now. You kneel down, begin to dig to find what set off your detector, and you see a couple of coins. You dig deeper, and to your surprise, you come across a trove of coins! You may not know unless you experience it. But Mike Smale of Dorset, England can tell you because, as of this year, he has! Mike is a member of the Southern Detectorists Club. He was on a hunt with about 300 other members as part of an annual club event. They were searching in a farmer’s field in Bridport, a market town in Dorset, England. 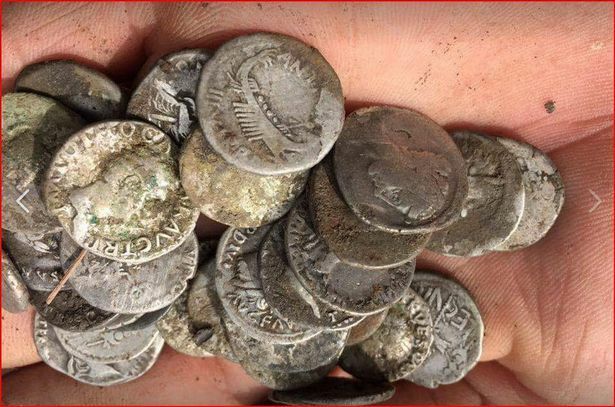 Mike’s total find was around 600 coins — denarii, more specifically — with each coin worth about 900 British pounds. A numismatist examined pictures of the coins and saw that some that were issued by emperors who ruled during the first century AD. But some of the oldest were issued by the Roman Republic before the birth of Christ around 32 BCE. Of these, some featured ancient Roman gods. Others featured a distinct Roman vessel. These were minted by Mark Antony while he was allied with Cleopatra in Egypt. It’s impossible to know what the lot is worth because there are too many factors to consider, like how rare they are and each coin’s condition. But what we do know for sure is that, whatever the worth, Mike has said he’s going to split it with the other members he was coin hunting with.